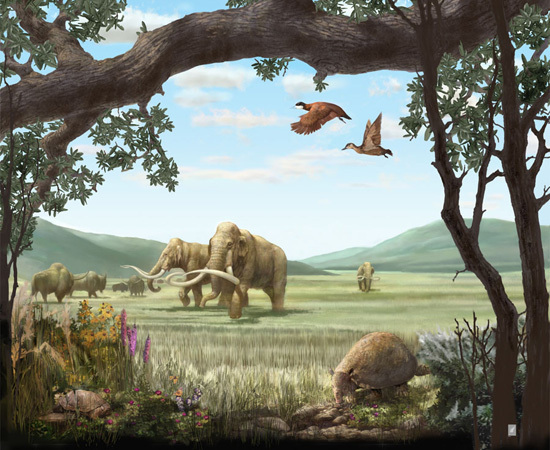 If a team of naturalists at Cornell University had its way, the Great Plains of North America may once again be home to lions, cheetahs, elephants and other megafauna that roamed the land 13,000 years ago. So forget Jurrasic Park; that is so 1993. For 2006: the near semi-ancient past. And they're not just talking about one or two desolate tropical islands. They have set their eyes on an entire continent. But nearby urban areas, so close to so many disease vectors, may be susceptible to deadly outbreaks, possibly to ones more lethal and contagious than AIDS and Ebola. Still, it's certainly fascinating to think that an hour or two car drive out of Pruned HQ, somewhere near the bland-sounding town of Rockford or Rantoul, you could be snapping away at a herd of elephants or a den of lions. 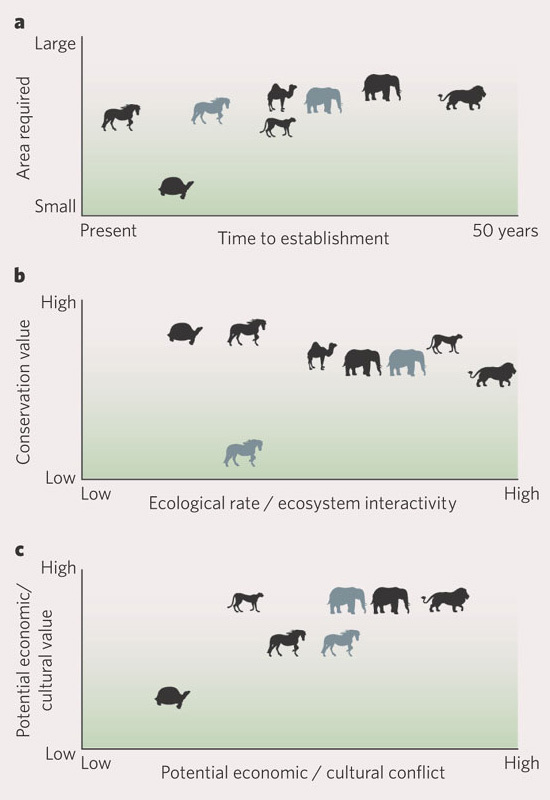 So how is this different from the introduction of starlings to North America or any of the other attempts to populate an environment that suits humans rather than letting nature takes its course? How is it different from any other attempt to create a romanticised past, or recreate a past that vanished of its own accord? Could we have the nomadic and low-tech humans in there too? I appreciate Donlan's idea in a proof-of-concept sort of way, but dislike what happens when well-intentioned efforts to manipulate biomes go astray. There is no difference! It's of the same species as prairie restoration (or as one friend calls it, prairie redemption), the National Park system, farms, Central Park, and Sea World. It's the Serengeti fenced-in to protect Oklahomans from being mulled by bears. And its ancestry can be traced back to the Garden of Eden. It's a romanticised past alright, but it's par for the course. I wouldn't be surprised to see a herd of elephants being taught a migration route by a well intentioned documentarians via land rovers. Or nomadic and low-tech humans, i.e. unemployed actors and landscape architects, as tour guides or attractions. So why is it then included in The New York Times Magazine Year of Ideas issue? All I can think of is the scale and scope of the project. That's all. For more on simulated worlds, check out Episode 38 of This American Life (11 October 1996). Coming soon on Pruned. Check it out: the Pleistocene Park hits Siberia.